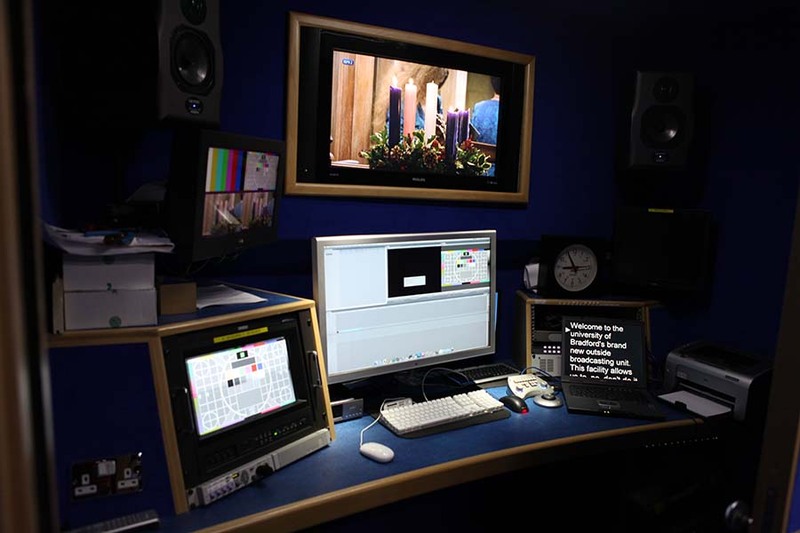 For many years, we’ve worked in partnership with the National Media Museum, just 5 minutes down the road in the centre of Bradford, using their television studio and edit suites. Unfortunately the museum has had to refocus their activities and have a space reshuffle – as noted by the fantastic new Life Online internet gallery. This meant we needed to find a new location for the TV studio, and bring their editing facilities in house (Incidentally, the partnership with the Media Museum is still in place, it is just the physical resources that have moved). As luck would have it, this came at the right time for us, as we were in a position where we needed to upgrade and move to full HD production. We were fortunate enough to have been handed a large lecture theatre, giving us around 144 square metres of usable space, with a ceiling height of well over 4 metres, perfect for fitting a high level lighting rig in, with office space next door in which to build a gallery. But as discussions progressed, we thought further about the way the broadcast industry was heading and the availability of such facilities at other universities. Since the department of Electronic Imaging and Media Communications was founded back in 1996, many other universities have jumped on the media bandwagon, especially in the 2000s, and we found ourselves in a new crowded marketplace. We needed to bring something new to our courses to give us back the unique selling points that made the courses stand out as they did in their first decade. We also knew that there would be a small gap between our move-out of the Media Museum and the completion of our own studio. At this point our Director of Estates suggested why not use an outside broadcasting truck? We knew it would be cost prohibitive to hire in a facility, just for a few modules of teaching, but this developed into the thought that we could actually build our own truck to compliment the TV studio. We would still have gallery facilities next to the studio, so if the truck was off site we could still do multicamera work, however, for our main teaching we could use the system as a drive-in studio. 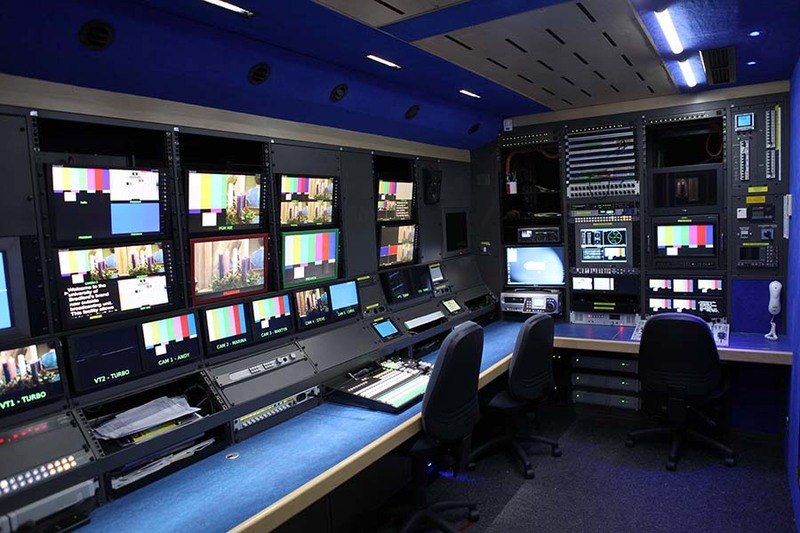 The concept of a drive-in studio has been used for many years – larger television productions often use a film soundstage with Outside Broadcasting trucks when other studio facilities are not suitable / available. Top Gear, for example, is filmed in a warehouse adjacent to it’s track at Dunsfold Aerodrome in Surrey. It would allow us to continue our approach to traditional studio multi-camera production, with the added benefit that we can go off-site for location drama, sport and other events. I knew this wasn’t going to be an easy task; when discussions surrounding a truck first took place, our senior management imagined a large van. However, aside from the logistics of transporting all the equipment to an OB, we would need to offer independent job roles for several students -equivalent to a major gallery or OB setup, as well as ensuring disabled access to the truck for wheelchair users to operate the equipment. With this in mind I looked into options for both new builds and second hand equipment. I was fortunate enough to find a suitable second hand vehicle within a few months of my search, when an EVS Server truck came on to the market. 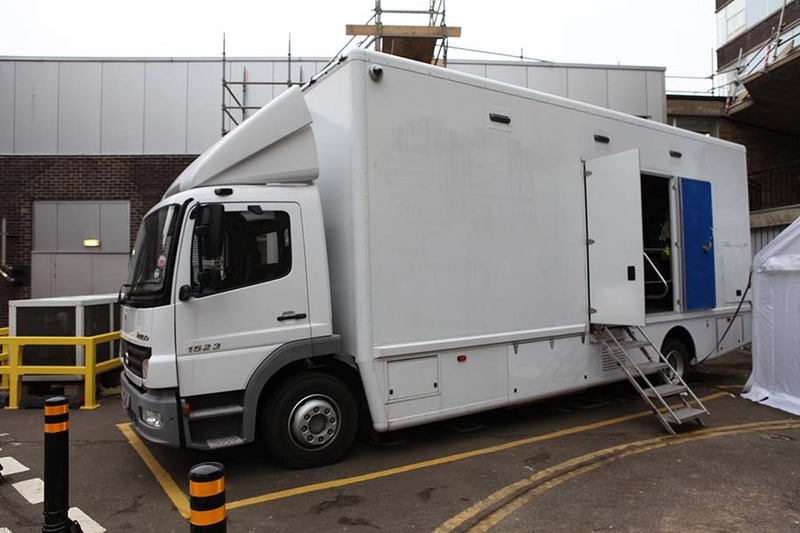 This was a 18.5 tonne Mercedes Atego chassis that had been built into a production vehicle to play in instant / slow motion replays for sporting events. In pristine condition, it significantly cut the cost of a new build, along with build time. The truck had a long gallery down one side of the vehicle, with an edit suite behind the cab. Whilst most OB truck have a layout running front to back, this limited accessibility for wheelchair users, due to the tight row of seating. I knew with a bit of modification, it would be possible to fit a second door, allowing us to use a disabled lift, and get equipment in and out of the truck easier. The size and weight of the truck would throw up some logistical challenges; at 10 metres long, we would have to find a suitable parking space where we could plug into our studio, but it seemed to offer an almost ready made solution. With the agreement of our Dean, we went ahead with the purchase, and it arrived in West Yorkshire for conversion in July 2011.